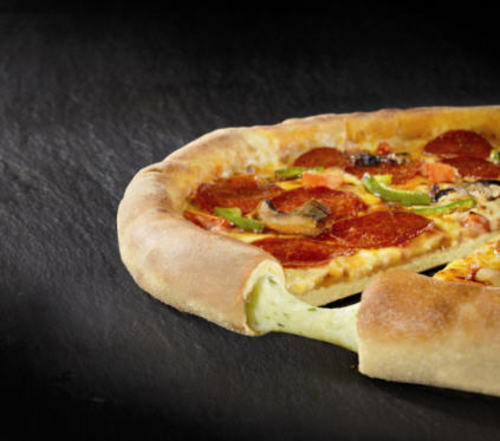 23 June 2011 - Following phenomenal demand from pizza lovers, Domino’s Pizza, the pizza delivery expert, has officially launched Domino’s Stuffed Crust. With the new Domino’s Stuffed Crust, your favourite pizza just got even tastier! Featuring mozzarella cheese with a hint of garlic and herbs in Domino’s famous fresh dough, Domino’s Stuffed Crust is now available on all medium and large pizzas. This mouth-watering addition to Domino’s menu can be purchased in all UK stores. Domino’s Stuffed Crust is being launched with a multi-channel campaign entitled ‘Get Stuffed’, running on TV, online and in print. Grab a slice of the action with Domino’s Stuffed Crust – order online at www.dominos.co.uk, use Domino’s iPhone and Android ordering apps or visit your local store. Domino’s Stuffed Crust is available on medium and large pizzas in Domino’s UK stores. As at 27 March 2011, there were 672 stores in the UK and the Republic of Ireland. Of these, 530 stores are in England, 47 are in Scotland, 27 are in Wales, 18 are in Northern Ireland, one is on the Isle of Man, 48 are in the Republic of Ireland and one is a mobile unit. Founded in 1960, Domino’s Pizza is one of the world’s leading pizza delivery brands. Through its primarily franchised system, Domino’s Pizza operates a global network of more than 9,350 Domino’s Pizza stores in over 65 countries. Domino’s Pizza has a singular focus – the home delivery of pizza, freshly made to order with high quality ingredients. This press release was distributed by ResponseSource Press Release Wire on behalf of Arena Quantum in the following categories: Food & Drink, Media & Marketing, for more information visit https://pressreleasewire.responsesource.com/about.